Lexington Vintage Dance is proud to present a selection of English, French, and American dance music from the first quarter of the 19th century. This CD includes 4 country dances, 3 waltzes, 5 mazurkas, and 14 quadrille tunes, a total of 26 tunes in all! They are played by five musicians: Jay Flippin (piano), Brice Farrar (violin), Rebecca Kiekenapp (cello), Dave Anderson (oboe, flute, and clarinet), and Merrilee Elliott (flute). 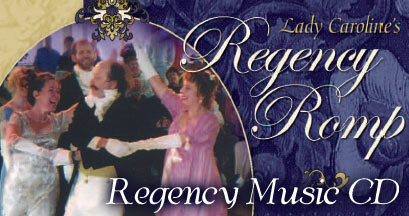 The title of the CD is "Lady Caroline's Regency Romp: Dance Music of the Early 19th Century". Make no mistake! This is not music for the wooden exhibitions and pedestrian displays commonly seen in period films, and neither is it for mincing about. It is strong and richly textured, like the lusty age which spawned it, with a mood that oscillates between sylvan sensuality and frenzied frolic. Much of this music is unavailable elsewhere. "This collection is a double treat -- important dance music which has never been recorded, and it's beautifully played, a joy to listen to." -- Richard Powers, Stanford University, world's foremost social dance historian. Included with the CD is an insert which includes 18 pages of information about the music, musical structure, the dances of the era, basic steps, suggested choreographies for some tunes, and sources for music and steps. To order your cherished copy on-line using PayPal or a credit card, click on the Buy Now button above. To order by mail, send a check payable to LVD to the address on our contacts page. Cost is $12 per CD plus shipping: $3.50 for 1 CD or $6 for 2-6 CDs inside the US. For other shipping situations, please inquire. Kentucky residents add 6% sales tax. Our Regency Romp CD is also available for digital download on CD Baby, iTunes, Google Play, Amazon, and other MP3 vendors. To download the insert only, click here.